Last Friday, March 30, John and I decided to have another go at getting to Coal Creek Bluff. I had called the Middle Fork District office about the downed tree, and either they or some other wonderful person had pulled the tree off the road. Happily, we were able to drive all of the intact section of Road 210 (about 1.25 miles) and parked just a short way before the first washout in the road. Upon getting out of the truck, we were unexpectedly greeted by a lovely chorus of frogs. They seemed to be off in the woods somewhere to the west of us. We quickly found a well-trodden trail leading right to a small pond hidden in the forest. A couple of handsome Pacific yews (Taxus brevifolia) spread their mossy branches out over the brush-filled water. The ranine symphony was stunning up close (click below to hear a brief minute of my favorite kind of outdoor concert). There must have been hundreds of frogs singing. After a while, we could pick out individual voices. They didn’t react at all to our presence, unlike the individuals I sometimes run across at home who quiet down if I get too close. We spent at least 15 minutes looking for a visual sign of our beautiful vocalists, but I never spotted one in the pond, and John eventually spotted only a single frog. Surprisingly, I did cross paths with one green Pacific chorus frog in the woods on my way to the pond. How could so many of them, so close to us, remain invisible—not even a ripple on the water’s surface? They weren’t the only musical ones. A woodpecker was drumming hard on a tree but was practically drowned out by the frogs. A little wren was adding its own melody to the frogs’ rhythmic chorus. What a delightful start to the day! John bravely facing the one obstacle to getting to our destination. We were only about a mile from the bluff, but we had one major hurdle to cross to get there—the creek that had thoroughly washed out the road. As I expected, it was much harder to find a crossing place than back in the fall when I was able to hop across rocks. 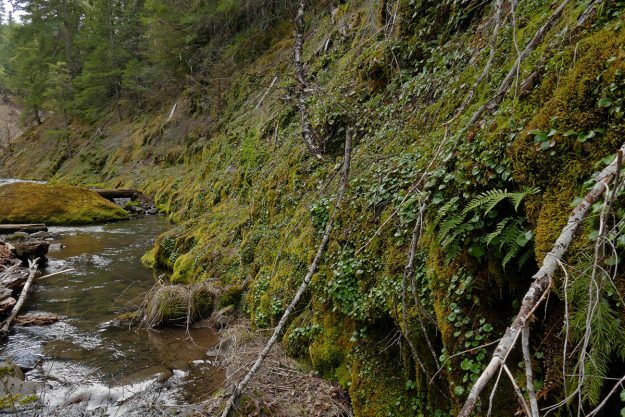 We headed upstream hoping for a narrower crossing, admiring the large vertical rock formations on the north side of the creek—I will have to find a way up to explore those someday! There were a number of rocks in the stream and several places where logs had fallen across the water. None of these potential crossings seemed safe enough, however: the logs were slippery, the rocks had gaps, and often there were vertical blockades on the other side of the creek. There were a few small patches of snow on the ground next to the creek, so we were quite reluctant to go in the water, but, eventually, we decided to tough it out and wade across the water. It was darn cold and deeper than I thought, but we both made it across without falling in or dropping any of our equipment, so we were relieved. Note to self: bring a towel and rubber shoes next time! Having gotten across the creek, it was only a few more minutes to the bluff. What a lovely spot! We were especially happy to be out in the warm sun after our barefoot plunge into the icy cold water. 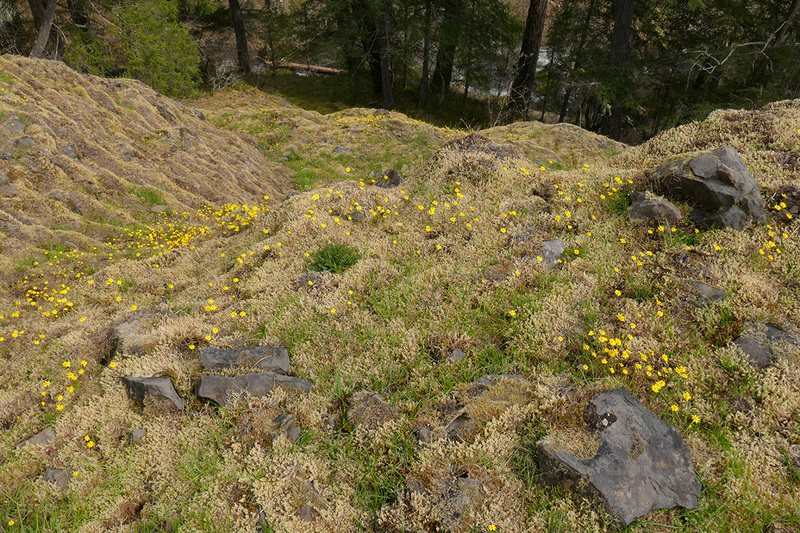 I was so pleased to see the slope covered with the darling bright yellow flowers of gold stars (Crocidium multicaule). While we had stopped to see them on the cliffs along Hills Creek Reservoir on our way out, this was one of the first times I’d seen them out in a meadow area. There must be a fair amount of moisture on the slope to make it suitable for them. About the only other flowers we saw were some little chickweed monkeyflower (Mimulus/Erythranthe alsinoides) and hoary manzanitas (Arctostaphylos canescens). There were quite a few manzanitas along the edge of the woods at the top of the slope. Many bees were attracted to the small urn-shaped flowers, but we also saw both a green comma and a California tortoiseshell nectaring on them. There seemed to be a tortoiseshell everywhere we went. Either there were several in the meadow, or we were being followed—it certainly seemed to be the latter! We also saw a single sulphur—quite pale but probably an orange sulphur—and one elfin, possibly a Moss’s elfin since we were near some broadleaf stonecrop (Sedum spathulifolium), its host food plant. 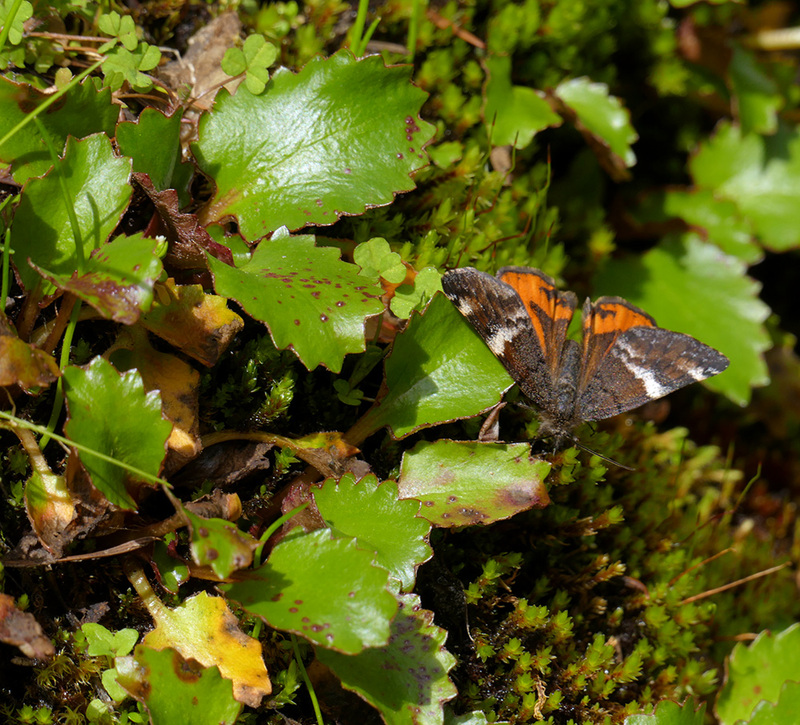 Several of these colorful moths (thank you Bruce Newhouse for identifying them as most likely the infant, Archiearis infans) kept us company by the creek side, this one sitting on the moss next to our mystery saxifrage. 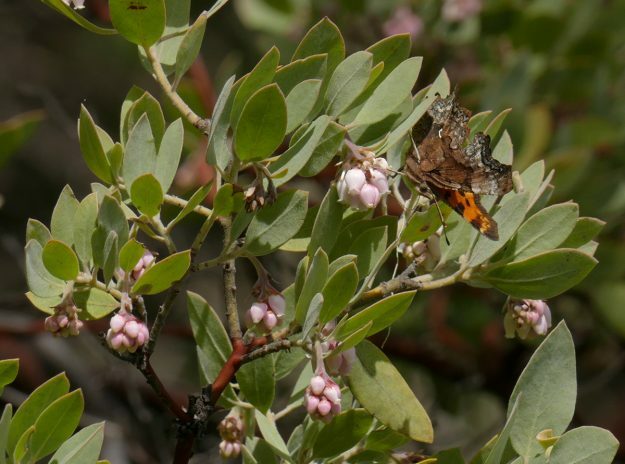 After lunch under the plentiful madrones (Arbutus menziesii), we headed down the south edge of the bluff to see the uncommon Sierra cliffbrake (Pellaea brachyptera) and to relocate the remains of the milkweed I’d seen last year. Luckily, I remembered I had made a small cairn to mark the largest plant, and we were able to find it easily. Not surprisingly there was no sign of new growth, but the remains of last year’s seed capsules were still evident. Gold stars blooming on the upper south edge of the bluff. 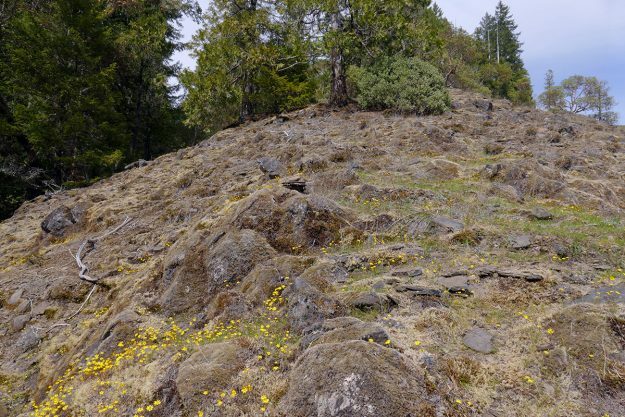 This is where both the purple milkweed and the Sierra cliffbrake grow. Next, we headed down the steep slope to Coal Creek to look for the unusual saxifrage I wanted to show John. It was beautiful along the water. Our timing was just right as the sun was streaming through the small gap the creek cut through the forest. Another hour and it would all have been in the shade. I was able to add many species to my plant list as a lot of the spring wildflowers were coming up now that had already disappeared by October on my first trip. There were a number of fawn lilies (Erythronium oregonum) right along the shore and many little larkspur (Delphinium menziesii) leaves popping up on the mossy rocks. The saxifrages, which we think might be Micranthes marshallii, were everywhere, but there were no buds on them nor on most of the rest of the plants yet other than a few California mistmaidens (Romanzoffia californica). We made a plan to come back in a month when there should be a colorful display. The steep, rocky bank of Coal Creek is covered with moss and saxifrages, both Saxifraga mertensiana and what might be Micranthes marshallii. Their sprays of white flowers should be quite pretty later in the spring. Heading back down the road to the truck, we once more had to make the creek crossing. We didn’t hesitate (much!) this time to take off our shoes and wade across right where the old road crossing had been. Safely on the other side, I dried my feet and looked more carefully at the impressive rocks on the north side while waiting for John to cross. No sooner did he reach my spot when he realized he didn’t have his camera with him. He was sure it wasn’t back at the bluff, but when we went down to the water’s edge, we could see the camera perched on a rock on the far side of the water! Note to manufacturers: Please make electronic devices that holler when they are more than 10 feet away from you! 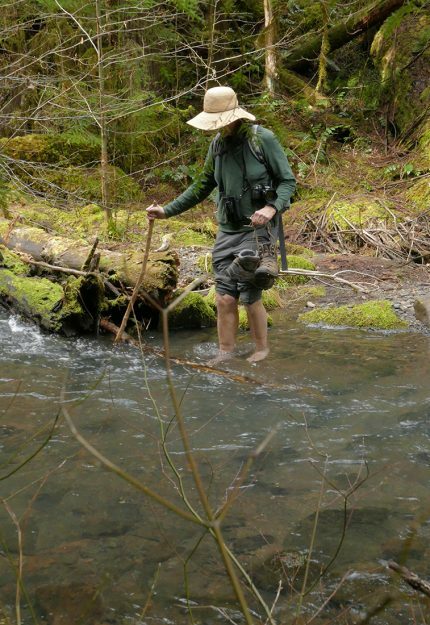 Poor John had to wade back across the frigid water—not once but twice! Not the way you want to end your day, but it gave us a good laugh—and you can bet he’ll pay more attention to where he puts his camera down next time!